Can you use limestone in a shower? 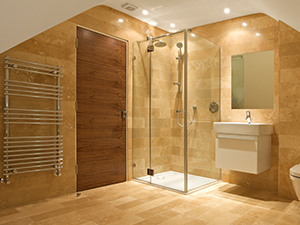 Natural stone showers, whether tub-surround or walk-in, play an important role in bathroom design and function. Stone selections vary by color, markings, and finishes, but most importantly, by stone type. If you have been considering limestone for your new shower installation, you may be better off with quartzite. Keep reading to learn why. Formed in shell beds and composed primarily of sedimentary calcite, limestone may contain small marine fossils. It is a beautiful stone, but it is also soft and prone to etching and staining. The success of a limestone shower installation depends on its density and porosity, which can be difficult to determine at the time of purchase. While some installations may be trouble-free, others can present difficulties. Fred Hueston, Chief Technical Director for Stone and Tile PROS, warns, "People use limestone in showers all the time, but it can be very high maintenance, and sometimes it can be problematic, especially light colored stone. Iron oxidation rusting can be a major issue. I have seen all kinds of problems with limestone in showers, from spalling and flaking to discoloration due to moisture intrusion." Can you use quartzite in a shower? A metamorphosed and slightly iridescent sandstone, quartzite is often used in outdoor areas, but is perfectly suitable for interior use, as well. According to Hueston, quartzite is a more reliable substitute for people who have been eyeing limestone for a shower installation. There are a few pro quos, however. He says, "I would recommend quartzite for a shower installation, assuming it is properly installed, and assuming it is pure quartzite, not marble being sold as quartzite, a common shady practice in the market today." Obviously, one should be careful to choose a reputable fabricator when having quartzite, or any stone for that matter, installed in a shower. Feel free to contact us with any specific questions you may have about selecting natural stone for your shower installation.